Mill-Max has expanded its family PCB interconnects with the addition of 2mm pitch connectors in both single and dual row pin headers and mating sockets. These SIP interconnects can be ordered in various lengths, in pass-through, right angle and surface mount versions. Mill-Max SMT interconnects are also available in .050" and .100" pitches. Mill-Max surface mount SIP interconnects with gull wing leads are specifically designed to provide maximum solder joint strength and easy inspection. 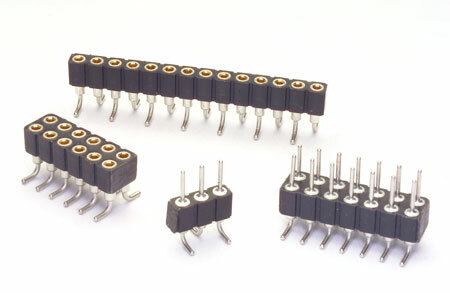 They use insulators made of high temperature material suitable for all soldering operations. All pins and sockets utilized in these 2mm connectors are precision machined brass, plated gold or tin. Press-fit into every mating socket is a beryllium copper "multi-finger" contact renowned for its compliancy and proven reliability.